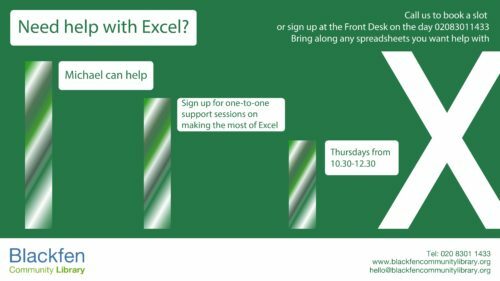 If you’d like to learn the basics of Excel spreadsheets, or have a bit of experience but want to know more, our volunteer Michael can help! He’s available every Thursday morning from 10.30-12.30 to answer all your queries and help out with anything that’s got you stumped. Contact us or speak to someone at the library front desk to book an appointment.